Dark Portal is the reward from the Dark Portal Hearthstone loot card found in booster packs from the Betrayal of the Guardian WoW TCG expansion set. 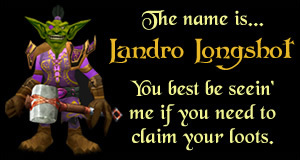 This loot card can be redeemed for an item that serves as a Hearthstone replacement. 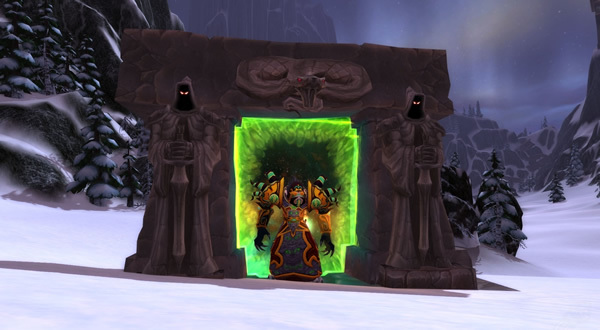 You can use the item to summon a miniature version of the Dark Portal to Outland (see the video below...this is a truly awesome loot item!). The Dark Portal Hearthstone loot card is an uncommon loot card -- found in approximately 1 out of 121 booster packs of Betrayal of the Guardian. Betrayal of the Guardian booster boxes are currently selling for around $100 right now, which would put the 'approximate' price of this card at around $500 -- were you to try and pull it from a pack. 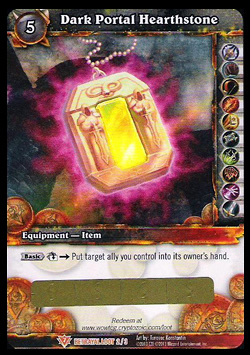 However, the Dark Portal loot card be purchased right now for around $35... a much better buy!